Where is That Buttery Chardonnay? Walking into a wine tasting room with 111 wine distributors, and thousands of bottles of wine, can be overwhelming. Where do you start? 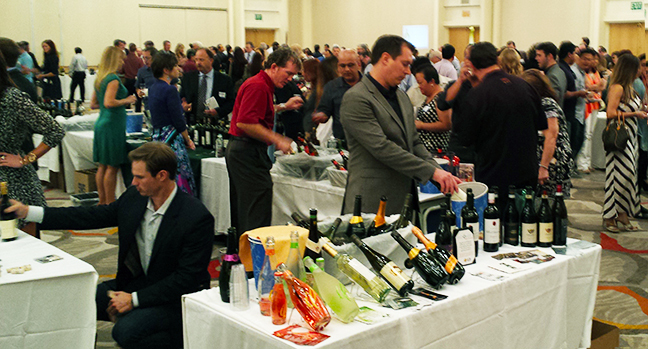 Wines from Europe, Washington State, bottles of wine from South Africa, and untold numbers from California were available to taste at The Fall Trade Tastings hosted by Southern Wine and Spirits, a major Southern California distributor. Held on October 12 in Irvine, the invitation only event drew thousands of restaurant, bar, yacht club and country club managers and owners. As the Bar Captain of our club, I was invited. Winemakers looking to distribute new product (CucuOne – cucumber juice, South Africa‘s Seven Sisters & Washington State’s MaryHill Wine) attended as well as the tried-and-true winemakers of Washington, Napa, Sonoma and Paso Robles like Justin, Cline, Rodney Strong, Mondavi, Coppola and Ste. Michelle. After digging through a long list and getting organized, I started sampling and comparing buttery vs. stainless Chardonnay before I moved on to red wine. Tasting and spitting all the way, no drinking here. There’s just too much to taste. In fact the great thing about these trade events is the common use of ‘spit’ cups and pour buckets. With this wonderful opportunity to sample a broad variety of beverages, attendees want to be able to taste the entire evening and not let alcohol alter their palette. Besides that, they’ll have to drive home and nobody needs that kind of trouble. That’s a mighty big list of wine to taste in one afternoon (four hours.) But it isn’t if you’re spitting, if you’re not drinking. And you can ‘spit’ gracefully, you don’t really have to spit, you simply express the wine into another cup and get rid of it. Then pour it in the discard buckets along with your discard glass of wine. I didn’t have enough time to get to several California wineries. I would like to have tasted a bottle of wine from wineries like Francis Ford Coppola, Malibu Family Wines, Premium Port Wines, Silverado Vineyards, Ste. Michelle Wine Estates And Villa San Juliette Vinerards. There just wasn’t that much time, and my palate was overloaded. So when you’re out there wine tasting, take it easy. You don’t need to swallow wine you don’t cherish. Spit and discard wines that don’t sing for you. Save your palate by not overwhelming it with too much alcohol. Then, enjoy the great wines, and drink just a little bit. Many of these bottles of wine are available retail while some are only available in restaurants and bars. This entry was posted in Blend, California Wineries - New World Wines, Chardonnay, Cuvee, Pinot, The Pleasures of Tasting Wine, Zinfandel and tagged bottle of wine, california, chardonnay, pinot, Sauvignon, tasting, wine, wine tasting room, winemaker, wineries, zinfandel.